Kathari Deutera, or Clean Monday, marks the start of Lent prior to Greek Orthodox Easter and it could well be our national day for picnics & kite-flying. It’s also a tradition to feast on seafood like taramasalata, octopus, calamari and other delicious vegetarian and shellfish treats. 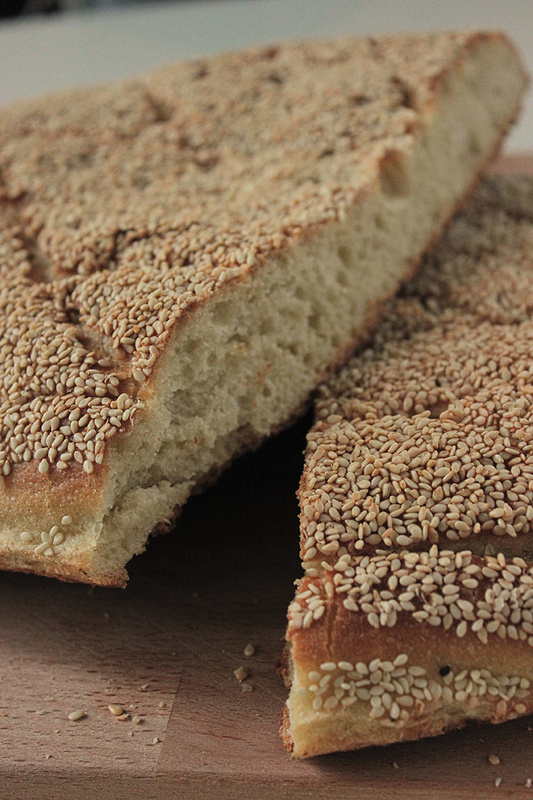 These compete with lagana, a festive sesame flatbread, and halva for pride of place on the table. Or, because we usually spend the day outdoors, the picnic blanket! We usually grab out food and drag our kites up hilltops or to the seaside. This year, it was a very gloomy Monday morning though, with rain and a thin brown cloud of Saharan dust drifting a veil across the blue skies. Even so, a few brave kites took off in the afternoon. But predictably, attention shifted to the seafood feast. And ouzo! Because seafood and ouzo are made for each other! I went to town on taramasalata this year. I didn’t make just one, but 3 versions. The first is with bread, Grandma Nia style, the second with potato, following Eleni’s recipe (my best friend’s mum) and the third attempt was with olive oil only, a bit of a trend amongst purists around here that I couldn’t help but try. Soak the bread in water and remove the crusts. I normally get a traditional loaf from the bakery that has a thick, crunchy crust which is easy to remove after soaking. Squeeze out all the excess water, the bread should be left with very little moisture. Add it to the blender with the onion, dill and tarama. Mix well and add the lemon juice. Keep on mixing and start adding your olive oil a bit at a time. Peel and boil the potatoes. Once warm, put them in the blender and mix for 1 minute. Add the tarama and blend for 3 more minutes. Stir a little using a spoon and then put the blender back on. Now you will start adding the olive oil and lemon a bit at a time, alternating between them until you have used everything up. It should be ready in 3 minutes. Add the onion and cod roe to the blender. Mix well and start adding the olive oil bit by bit. The more you oil the more homogenous your mixture. And yes, this is very much like making mayo! Now how on earth to choose which is the best? I like the bread taramasalata for its fragrant lemon and dill; the potato version won me over with its creamy rich consistency; the minimalist olive oil recipe is much lighter and reminded me more of a dressing than a dip, very light and great for drizzling. And as for the rest of my family? Mum staked a claim to the bread recipe, which brought back some lovely childhood memories for her. Dad loved the smooth potato taramasalata. My other half went for the simplicity of the taramasalata with olive oil. Apologies, there were no ouzo photos, the dips made me somewhat thirsty. To compensate, here is the traditional sweet of the day, halva with chocolate, that also competes with the semolina one. They all look delicious ! I always make it just with olive oil, my Mother-In-Law’s recipe. That’s my favourite 😊 Καλή Σαρακοστή ! I love the one with olive oil myself! Καλή Σαρακοστή!